Podcasting continued to grow in both audience and programming in 2015, though listening is still limited to a minority of the American public, and roughly half of the country is not even familiar with the term “podcasting.” Podcast producers continued to experiment with potential revenue streams during the year, while some in the industry took steps to try to begin to move beyond downloading as the standard of measurement for listenership. Note: Edison's survey is conducted in January and February of each year. "State of the News Media 2016"
That percentage rises to 36% when it comes to those who have ever listened to a podcast – double the share who had done so in 2008, according to Edison. And, reflective of the country’s shift to mobile more broadly, mobile devices (smartphones, tablets or other portable devices) are increasingly preferred over desktops or laptops for podcast listening. In 2016, 64% of Americans age 12 or older who have ever listened to a podcast said they were listening “most often” on a mobile device, compared to 55% in 2015. Conversely, 34% said in 2016 that they listen most often on a desktop or laptop computer, while 42% said this in 2015. Still, even though more people are listening to podcasts, it is worth noting that the medium accounts for only a very small sliver of the share of time that Americans spend listening to all audio sources. According to Edison Research data from their Share of Ear Survey conducted in the fourth quarter of 2015, only 2% of all audio listening is spent using podcasts, compared to 54% of time that is spent listening to AM/FM radio. While overall podcast listenership is on the rise, one factor that could be standing in the way of even greater growth in audience is familiarity. As of 2015, only about half of Americans age 12 or older said they were familiar with the term “podcasting” – a share that has remained relatively flat in recent years. % of U.S. adults ages 12 or older who say they are familiar with the term "podcasting"
There are no widely accepted estimates of the total number of podcasts produced in the U.S., including those that focus on news and public affairs. However, publicly available data from one of the largest commercial podcast hosting companies, Libsyn, continues to indicate an upward trend in both the number of podcast shows hosted and the number of download requests over the past four years. In 2015, the company hosted 28,000 shows, an increase over the 22,000 shows hosted in 2014 and the 16,000 shows during 2013. Source: Publicly available Libsyn internal data. Libsyn also reported an increase in the number of podcast download requests made in 2015, a number that has more than doubled since 2012. In 2015, Libsyn had 3.3 billion requests for downloads, up from 2.6 billion in 2014, 1.9 billion in 2013 and 1.6 billion in 2012. Libsyn’s data for downloads by preferred type of device tracks with the mobile preferences reflected in Edison’s survey data: 69% of podcast downloads in 2015 were requested from mobile devices, while just 31% were requested from desktop and laptop computers. In 2014, 63% of podcast downloads were requested from mobile devices, compared with 37% from desktops and laptops. Just as the audience for podcasts is smaller than that of other media, the business of podcasting is too. In 2015, advertising spending on podcasts was estimated to be around $34 million dollars – a small drop in the bucket compared to most other major media sectors. While advertising constitutes the dominant revenue stream for the medium, a 2015 report from the Tow Center for Digital Journalism portrayed the current period as one in which podcasters are actively experimenting with a wide range of revenue streams. Among the models identified are various forms of direct support through platforms such as Patreon or Kickstarter, grants from foundations, subscription or “freemium” models, and staging live events such as conferences or webinars. While the podcast industry is growing, some observers and industry insiders say that the lack of better metrics is acting as a brake on more rapid revenue growth. The main way a podcast’s audience is generally measured is through downloads. Download data, however, is limited in that the statistics do not identify if the podcast downloaded was actually listened to, either in part or in its entirety, or how many different people may have listened to the podcast. The limitations of these download statistics have had downstream implications for advertisers, who need audience data to drive buying decisions – as well for podcast producers who could potentially attract more advertisers and further grow their audience if there were more granular data on actual listenership. In response to these limitations, a group comprised of staff from several public radio stations and networks released a report in February 2016 proposing new standards for defining a “download.” The report was an attempt to identify and address a number of specific ways that existing technologies could artificially inflate download statistics – such as bots or progressive downloading (a downloading process that allows a user to begin to listen to the podcast before the download is complete and may result in multiple calls from a device for the file). And in April 2016, Nielsen announced that later in the year it will begin to measure on-demand audio and podcasting as a part of its Digital Audio Ratings Service. Panoply – the podcast network of Slate – launched Megaphone, a content management system that can gather more granular data on listenership. The use of a format other than MP3s – such as that developed by Acast – is capable of delivering advanced metrics for advertisers, but it is a more expensive platform for them. 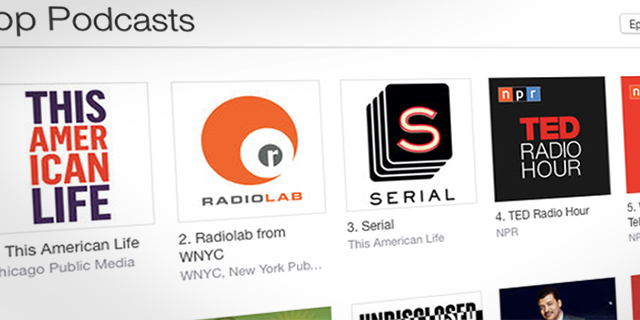 And, it is possible that Apple and Google may become much more dominant in the podcast advertising space. Measurement concerns notwithstanding, however, many news organizations – both large and small, legacy and non-legacy – moved ahead with increased investments in podcasting during 2015 and early 2016. While the “Serial Effect” may have encouraged the creation and expansion of more podcasts, several other factors have also converged to further encourage media organizations to expand into the podcasting space. Technologies – such as apps and platforms – have made podcasts easier and more convenient to listen to, and business models have evolved to better translate podcasts into sources of revenue. Podcasts are being leveraged by legacy organizations to cross-promote content or by any kind of news outlet to offer a deeper dive. And more broadly, the on-demand format of podcasts offers consumers an additional way to access news and information in a changing media landscape, while offering media organizations a potential new avenue to grow audience. And on the local front, the Des Moines Register, which turned to long-form narrative podcasts in order to explore one story in depth. Goat Rodeo – a podcast network focusing on local issues around the Washington, D.C., area – launched in October 2015.